From the series, Waterloo. © Fiona Wolf. Page is 74-years-old. She has lived in the area for a very long time. "They came to talk to me and told me not to worry. It [relocation of people] won’t come true. They said not in my lifetime." From the series, Waterloo. © Fiona Wolf. The first family I visited at home is Olivia and the two Matthews. Olivia is one of three transgender people I met within the first week of shooting in Waterloo. She moved to Waterloo in 1991. “I would love to have had children.” And now Olivia is like a mother figure to the two boys, who live with her: gay couple Matthew & Matthew aka Mildred and Betty. “The view from my apartment is stunning. The only thing that would make this place better is a bathtub!” Her message for the city of Sydney: “Leave us alone, go away”. From the series, Waterloo. © Fiona Wolf. I also visited a Russian family and met three generations who have grown up in the Waterloo housing estate. Marina: “The kids used to be scared because people at the parks and in buildings can be rowdy. You also find needles everywhere. Every floor is different. It depends on your neighbours.” “I used to have to go to the toilet with an umbrella, due to leakage. The maintenance is bad. Living here, you don’t want to look like you have money. You don’t even want to dress nice. However, the security system that is in place is very positive and helpful.” From the series, Waterloo. © Fiona Wolf. 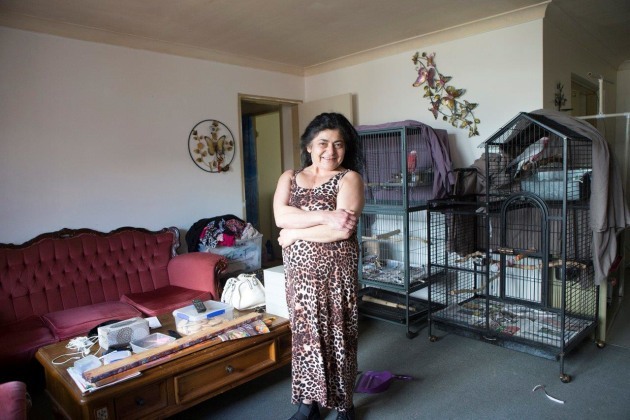 In the not too distant future, 4,500 families, elderly, disabled, and low-income people will be displaced as a result of development of the Waterloo housing estate. 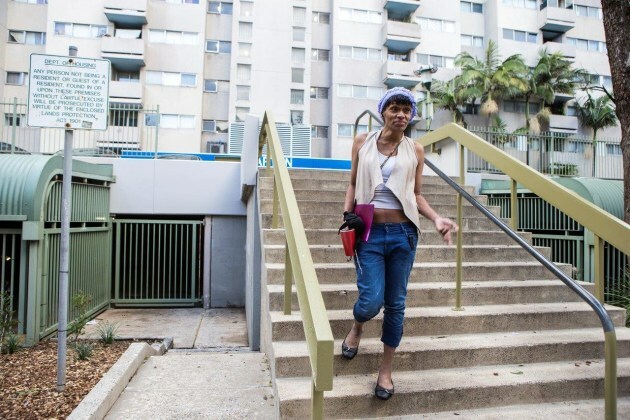 Sydney-based photographer, Fiona Wolf set out to document the plight of people with an uncertain future. 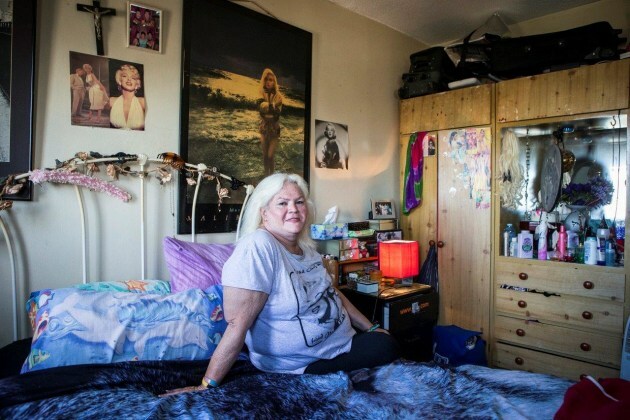 Waterloo is a personal photographic project that focuses on the people who live or work in the area of Waterloo housing estate. 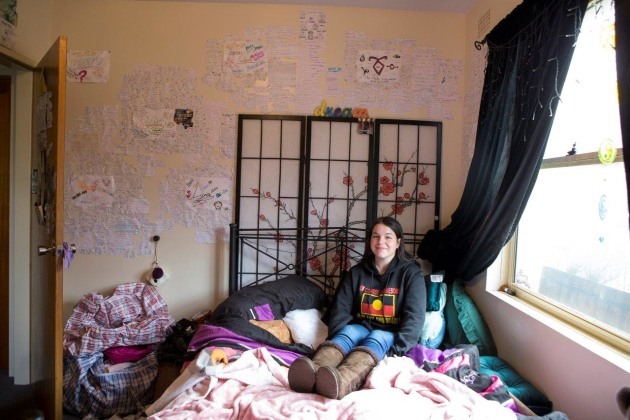 The project to photograph people and their life in Waterloo came about from the idea to give photos to people who most probably can’t afford to get professional photos done. And more importantly to give them a memory of the place they call home. For all of them, their situations are about to be changed drastically by the onset of the redevelopment plans which will see 4,500 families, elderly, disabled, and low-income people displaced. At the outset, I was a little uncertain about safety. My aim was to get into people’s homes. When I was told by residents that they had been mugged in the lift, I was a little concerned by showing up with a rather large and expensive-looking camera. Also the fact that I look like a privileged middle class white lady didn’t give me the confidence to approach the ethnic and Aboriginal community. However, all these fears vanished once I started shooting. I also called some of my mentors for guidance and that helped a lot. I soon had to learn to not be judgmental, but just document. You listen to a person with serious health issues like an amputated toe and lung emphysema, and they can’t stop chain-smoking. People who claim that the disheveled state of their home is due to them being in transition. And that seems to be their life. At the same time I have never been welcomed so warmly as a stranger into people’s houses who openly shared their story with me. And gave me cups of tea and sandwiches. The misperception of what life is like on the Block needs to be changed by showing all these people and their love for their home and the community. During my time shooting there, I experienced one suicide, a fist fight, several brawls, and also big hugs from my favorite lady, Luwanna, who rules over the Waterloo Green. It is certainly a diverse place. People are invited to join action groups and information sessions about the redevelopment. But the fact is that most of them are so caught up in their every day life struggles that they can’t think that far ahead. Not to mention that literacy is an issue, along with the influence of drugs and alcohol. But even the most sober people are not quite sure what is actually going to happen in their hood.